It's been a while since I've used a physical exfoliator, but I recently got the urge to "scrub"my skin after such a harsh and cold winter. So I was even happier when I was able to try JUARA - Radiance Enzyme Scrub, which is a 2-in-1 product. JUARA - Radiance Enzyme Scrub, is a gentle, yet powerful scrub which exfoliates and refines skin, as well as a enzyme mask which gives skin an extra boost of radiance. 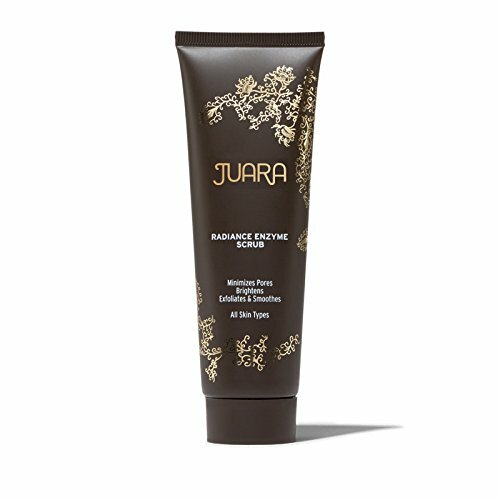 JUARA - Radiance Enzyme Scrub contains a skin brightening complex along with Jojoba and Bamboo Beads, Clove Flower to help and even out skin tone by inhibiting melanin creation, nourishing Candlenut Oil, skin softening Apple Enzyme and pore purifying Cinnamon. JUARA - Radiance Enzyme Scrub is perfect to use at the beginning or end of the day or before going out at night for extra glow. I cleansed, scrubbed and then left it on my face for about 3-5 minutes. JUARA - Radiance Enzyme Scrub was also great to use while I was in the shower. I applied it before I start my shower, and by the time I finished all my body care, it was time to rinse off before you got out of the shower. My skin really felt like all the dead skin cells were removed (gently!) and it was smooth and soft after rinsing. I had a beautiful glow and my skin looked healthy and toned. I was also happy my skin didn't feel or look irritated or dry. JUARA - Radiance Enzyme Scrub is my go-to skin treatment about 2x week. The scrub has a light, slightly herbal scent that fades away quickly. JUARA - Radiance Enzyme Scrub is a great treatment with natural ingredients that makes a noticeable difference in skin, while still being gentle. *This product was provided courtesy of Juara PR for reviewing purposes.